By George M. Dickert, Horticulture Extension Agent, Spartanburg County, Clemson University. Downy serviceberry (Amelanchier arborea) is a deciduous, small tree or shrub in the rose family (Rosaceae) with a native habitat stretching from Maine to Iowa, south to northern Florida and Louisiana. It can be found throughout South Carolina and is hardy in Zones 4 to 9. It is also commonly known as Juneberry, Shadbush and Sarvistree, depending upon which part of the country one is in. 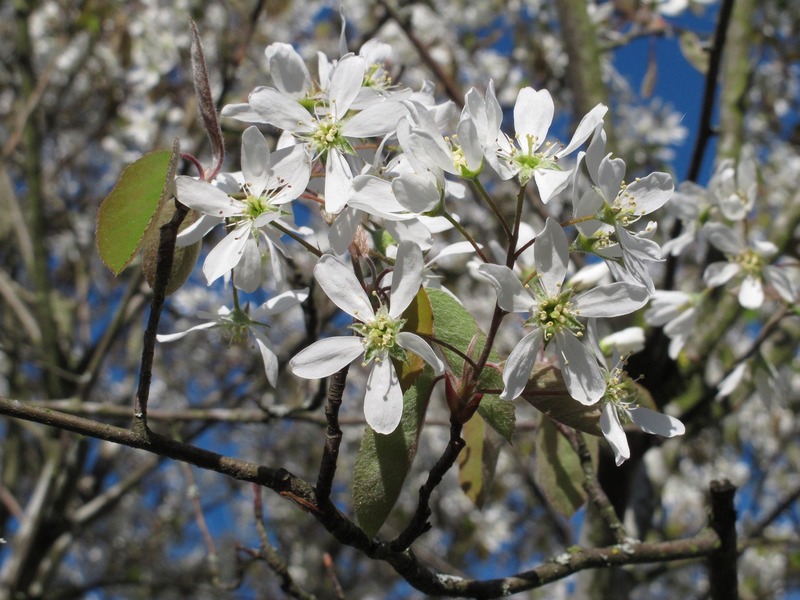 The "service" in the common name serviceberry refers to the plant usually being in flower around Easter. This woodland plant is among the first trees or shrubs to flower in the spring, with a profusion of white blossoms that are extremely showy, although short-lived. However, serviceberry should not be praised only for its springtime show as it also provides year-round interest in the landscape. Serviceberry usually grows to between 10 and 25 feet tall and 10 to 15 feet wide. It can however reach upwards of 40 feet, but this is rare in the landscape. It has a narrow, upright, rounded crown of medium-textured foliage with irregular branching habits. In general, the growth rate is considered to be moderate, attaining heights of 9 - 10 feet in a five to ten year period. However, in the landscape some cultivars may grow more rapidly. Serviceberry has an understated gracefulness that provides year-round interest in the landscape. The 2- to 4-inch long, showy, white flowers typically appear from mid-March until early April, and are borne in pendulous racemes. As mentioned before, the flowers are extremely ornamental, but the bloom period is short in duration (perhaps a week). The deciduous foliage is elliptical in shape, of medium texture, and has a medium to dark green color. The edible fruit matures in two to three months to small, sweet, blue-black berries that are relished by wildlife. The fall color is excellent with varying shades of yellow to orange to dusty red. Another feature worth mentioning is the showy bark that is smooth and grayish in color with vertical ridges. The young twigs are an attractive olive-green color. Serviceberry is often seen as a multi-stemmed shrub, but it also looks great pruned into a small tree to accentuate the ornamental bark. Serviceberry has a number of applications in the landscape. These include using as a screening plant, blending into shrub borders, group plantings, specimen plantings, and used in naturalized settings such as woodland edges. Serviceberry also provides a food source for wildlife. Serviceberry requires full sun to partial shade, with flower and fruit production improving with increased sunlight exposure. It transplants readily from field-grown balled and burlapped plants as well as from containers. It prefers moist, well-drained soils with a pH range between 5.5 and 7.0, but is noted for being adapted to a variety of soils. It is also useful in situations with occasionally wet, but well-drained soils. This plant is noted for being somewhat drought tolerant once well established, but would not be recommended for planting under high stress conditions. Another advantage is that they rarely require pruning to maintain their form, thus decreasing required maintenance. As serviceberry is in the rose family (Rosaceae), it is susceptible to many of the same disease and insect pest problems seen in other species within the family (e.g. apples and pears). Entomosporium leaf spot (Entomosporium sp.) may cause serious spotting and partial defoliation on some selections, especially following rainy weather. Cedar-serviceberry rust affects twigs, buds, fruit and foliage and can disfigure these plant parts or result in witches' brooms. Other minor diseases include powdery mildew and fire blight. Proper selection of resistant cultivars and good cultural practices can often prevent these problems from becoming serious. Japanese beetles, spider mites, aphids, leaf miners, several borers, pear slug sawfly and scale can sometimes become pests of serviceberry, but incidences of these pests are low in landscape plantings. Good cultural practices of fertilization and watering as needed will help prevent many of the insect pests associated with serviceberry. Amelanchier laevis (Alleghany Serviceberry): This species is most closely related to A. arborea, but can be distinguished by the bronze color of the unfolding leaves and their lack of pubescence, or hair. Its showy white flowers occur from late March through mid-April. The fruit is sweet, juicy and purple-black. This species is native from Newfoundland to Georgia and Alabama, west to Michigan and Kansas. The orange to brick-red fall color is outstanding. It is hardy in Zones 4 to 9. Cultivars include 'Cumulus', 'Prince Charles', 'R.J. Hilton', and 'Snowcloud'. This species is one of the parents of the Amelanchier x grandiflora hybrids along with A. arborea. Amelanchier canadensis (Shadblow Serviceberry): This species is distinctly different in habit from the A. arborea and A. laevis. It tends to have an upright, suckering, tightly multi-stemmed growth habit. It grows 6-10 feet tall, and is native to bogs and swamps from Maine to South Carolina. The showy white flowers appear in late March, usually blooming about a week after A. arborea. 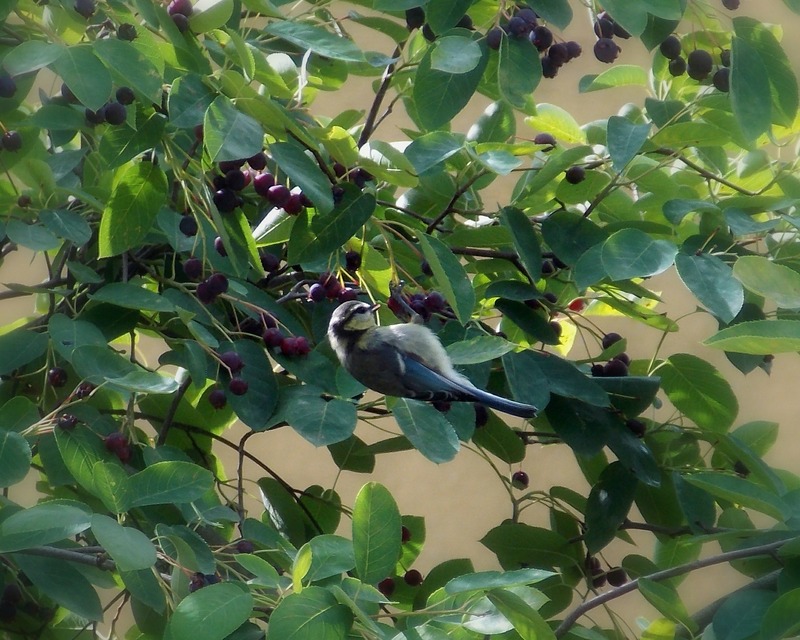 Birds love the sweet, juicy, black fruit. 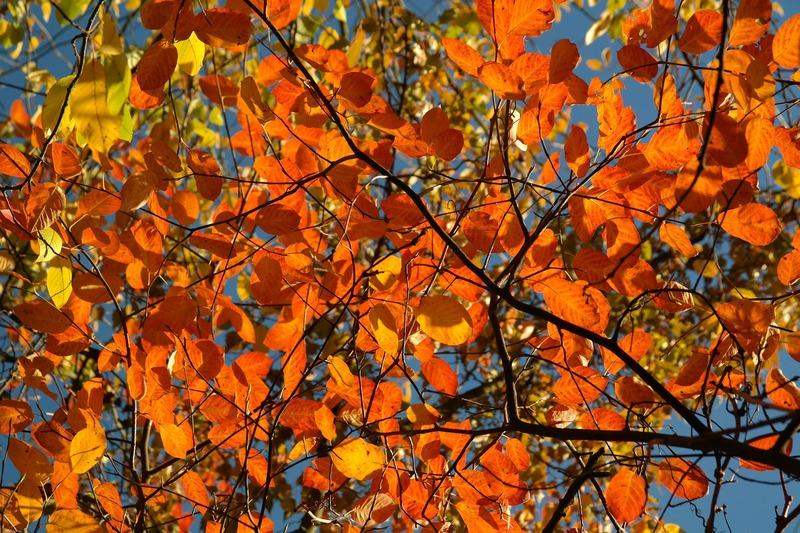 The fall color is typically yellow and gold, but may have touches of orange and red as well. It is hardy in Zones 3 to 7. Cultivars include 'Rainbow Pillar', 'Prince William', 'Spring Glory', and 'Tradition'. Amelanchier x grandiflora 'Autumn Brilliance': Amelanchier x grandiflora is a cross between A. arborea and A. laevis. This cultivar is noted as having good form, reliable flowering and brilliant red fall color. This cultivar matures at 20 to 25 feet and is faster growing than the species, especially under intensive cultivation. It is reportedly more resistant to leaf spot and fire blight than the species. Amelanchier x grandiflora 'Ballerina': This cultivar is noted for being an upright grower with spreading branches. The flowers are pendulous and the habit is more erect than the species. Young foliage is bronze-colored, maturing to a dark glossy green in summer and turning a dark bronze-purple in the fall. This selection grows to 15 to 20 feet high. It exhibits very good leaf spot resistance and is essentially free of fire blight. Amelanchier x grandiflora 'Princess Diana': This cultivar is noted for having excellent ornamental traits. It has abundant white blooms in the spring that mature to 3/8-inch diameter, edible, blue-black fruits. The red fall color is outstanding, and colors early while lasting late. Mature size is reportedly 25 feet tall by 15 feet wide. This cultivar is often available both in multi-stemmed or single trunk-type forms. It has excellent resistance to the leaf spot fungus.